We entered the state from the northeast, known as the First Coast. It’s aptly named as it was the first area in Florida history to be discovered and colonized by European settlers. 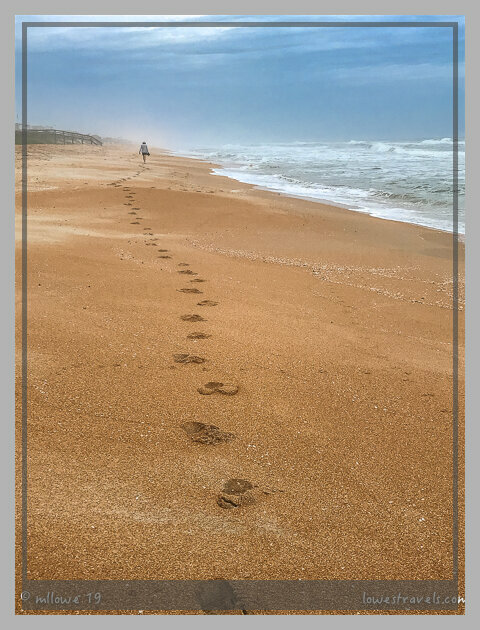 We spent a week at Gamble Rogers Memorial State Park, and while there we drove along the 6-mile stretch of highway A1A – the Scenic & Historic Coastal Byway – enjoying views of the ocean still unblocked by condos and tall buildings. 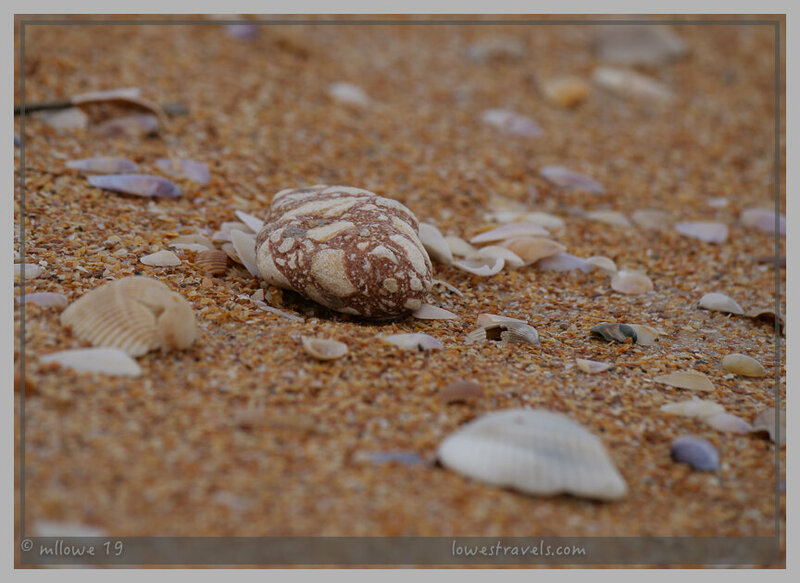 The beaches here have an orange hue due to the large amount of crushed seashells they contain. We spent another week on the Treasure Coast. Legend has it that several Spanish ships carrying gold and silver were shipwrecked in the area over 300 years ago, losing their treasures to the sea. 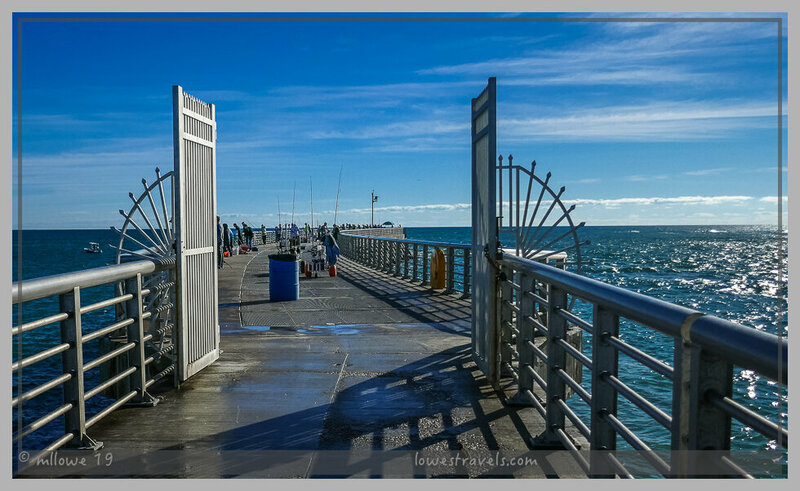 But the current treasure here is the abundance of fish available to anglers around Sebastian Inlet State Park, our home base for that stop. 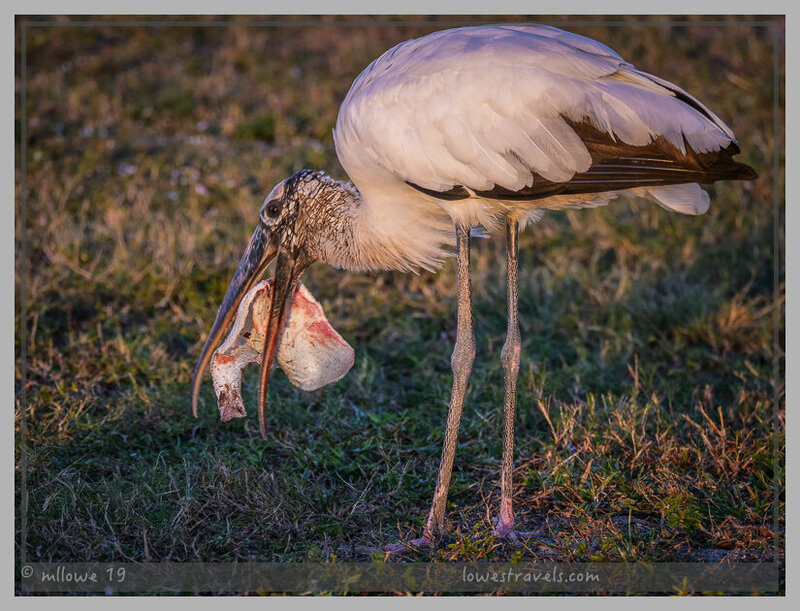 They fished from boats, from the shoreline, and from the pier – with Pelicans, Wood Storks, Egrets, Herons and Ibises as constant companions waiting for a tasty morsel they might be able to grab. This guy was a birdie rock star! 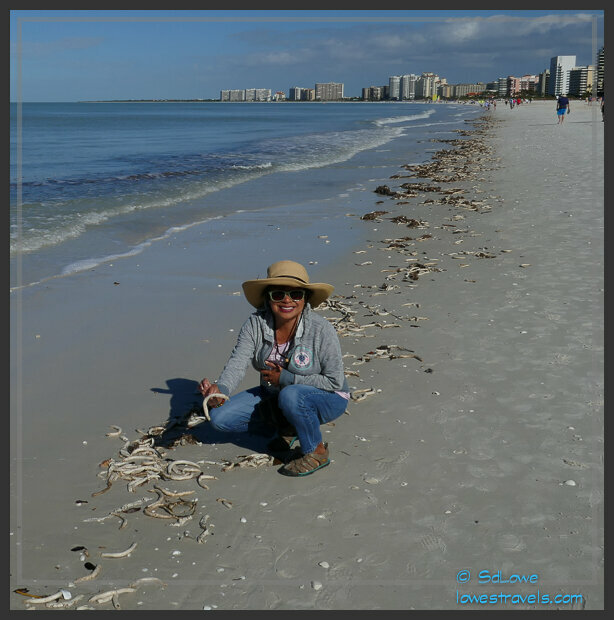 Crossing the state to the Gulf Coast, we stayed in Naples for the month of January. 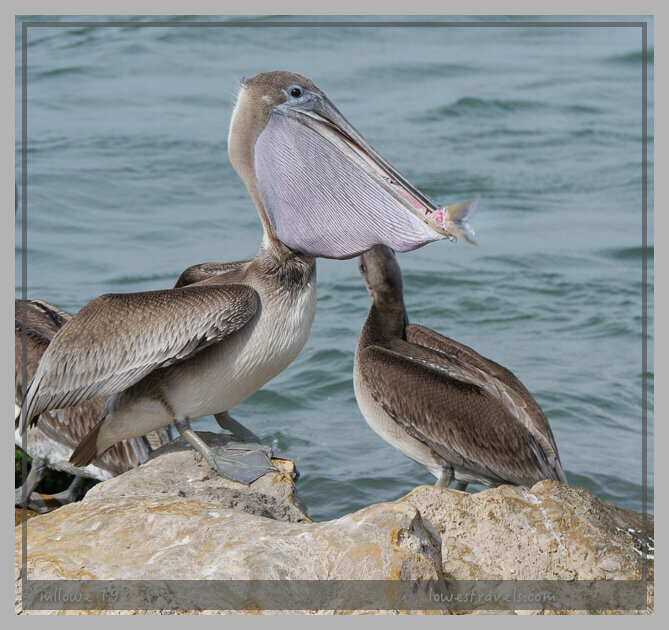 This area is referred to as the Paradise Coast, known for its many beautiful barrier islands from Sanibel down to Marco Island. 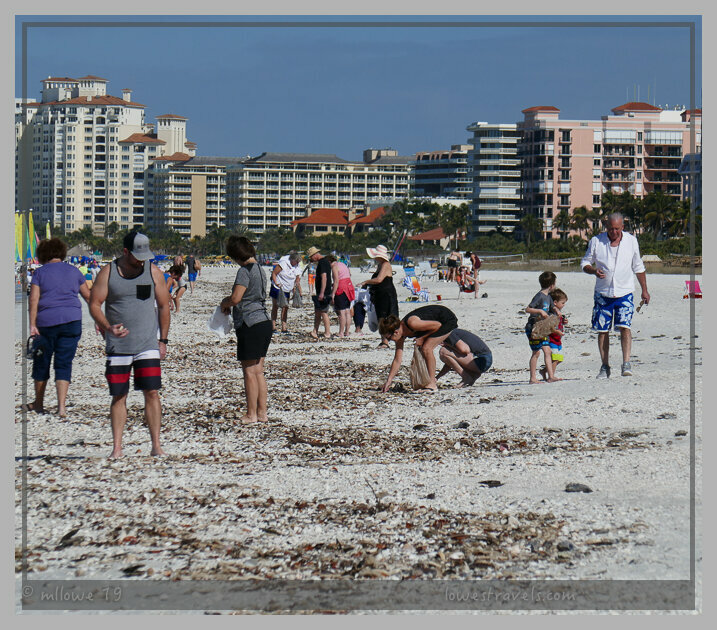 Shelling is a big activity here, and I wished I could have taken some of the beautiful and unique specimens with me. Here’s a rundown of our stay in that area. It was at the Nature Coast where we had the most fun exploring the “real Florida”. Read about our outdoor activities here. At the Forgotten Coast, where a relaxed pace of small-town charm was the norm, we chowed down on the area’s awesome delicacy – oysters! 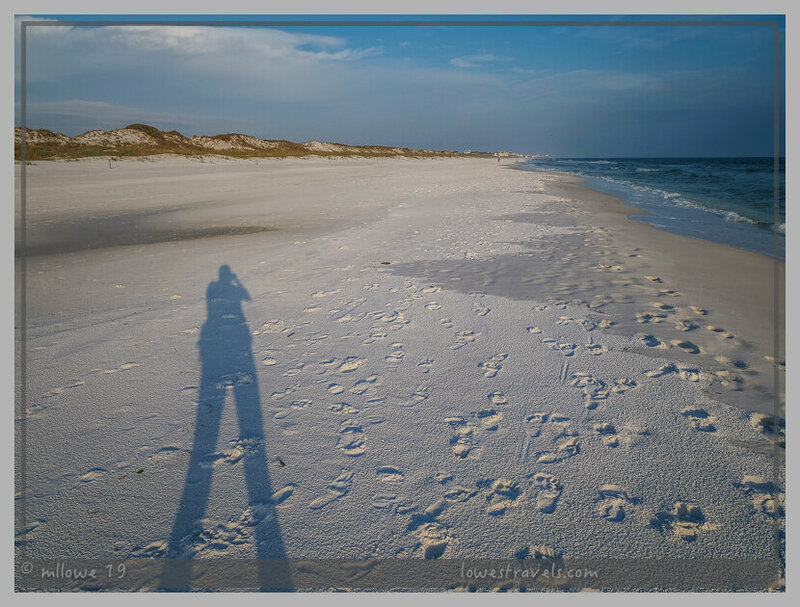 Here’s my recent post about our visit to this area of coastal beauty, no longer forgotten since hurricane Michael pretty much wiped it out last October. …or good ol’ raw – yeah! Do you have a snack for me? Celebrating seven years on the road with a pound of delicious steamed gulf shrimp! We thought this stop was going to be a chance to stretch our legs on a nice long walk, but we were dismayed to find that all of the trails were under water. And we had only one sunny, dry day to enjoy the outdoors – bummer! The shrimp version was a winner! 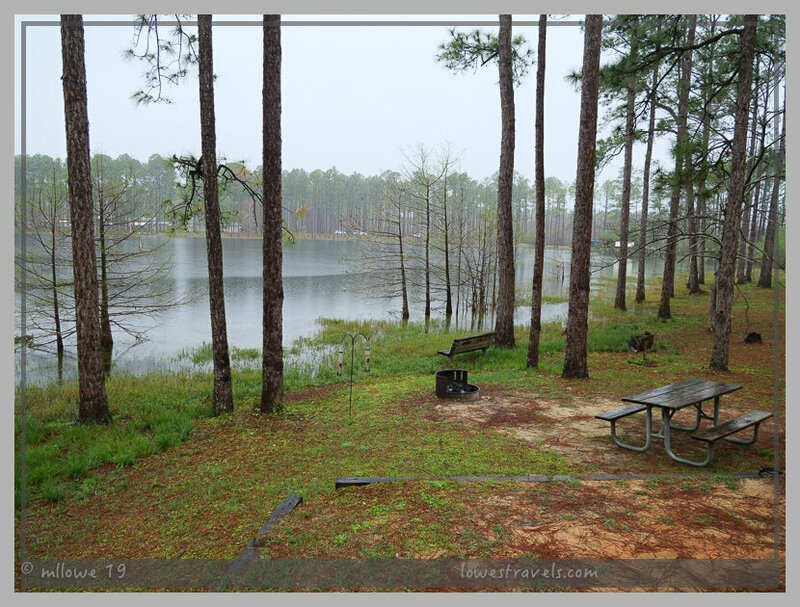 We learned that our virtual friends Jeff, Debbie and Rick of We are the Millers + Rick were camp hosting on the Emerald Coast at Topsail Hill Preserve State Park. We were hoping to meet up with them for a happy hour in the park, but since the weather wasn’t cooperating we got together at a nearby restaurant for some good pizza and beer. We had a lot to talk about and are hoping to see them again down the road. There were several trails at Topsail Hill Preserve SP, but our exercise was limited to taking in the ocean breezes during walks along the beach from our campsite. Not so bad! The freezer was packed with fresh seafood during our stay, enough to carry us well into summer. We had no complaints about our 3-month seafood diet! Gulf shrimp is the best! That wraps up our winter months in Florida. Despite the mostly nasty weather, it wasn’t so bad after all! “Making the best of it” seems to be the common refrain among full-time RVers this winter, but you sure managed to! I can’t share the love of oysters, but I’d gobble up some Gulf shrimp YUM. 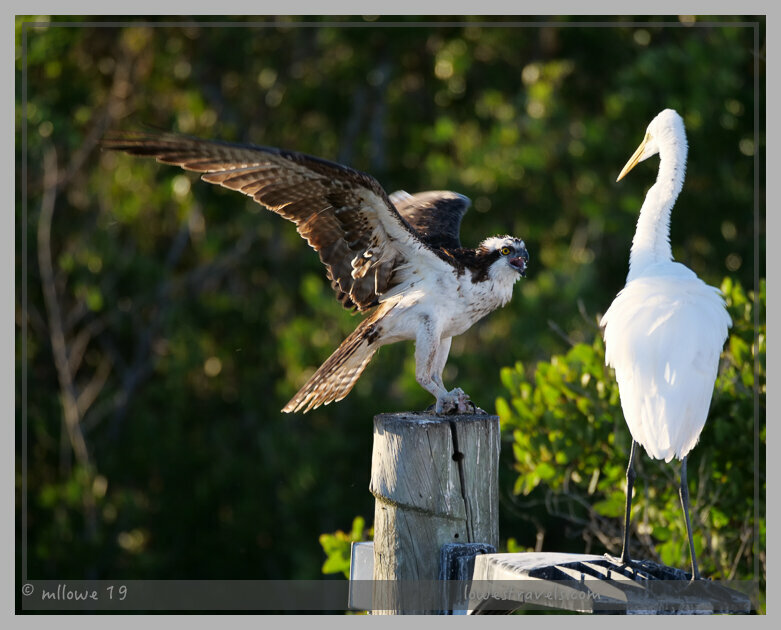 I love the osprey and egret facing off — who won? We all did make do of what we were given so I ain’t complaining just saying 🙂 It was a long shout out and both flew away! Great recap, I know Debbie was excited to meet you guys. See you out west next winter. Looks like you’re already putting your seafood bounty to good use. Steve’s shrimp quiche looks fantastic! I agree Gulf shrimp is the best. Most of all, we are delighted that you planned your travels so that we could spend time together in Apalachicola. Being with you guys was one of the highlights of our winter. Happy seventh travel anniversary, and wishing you many, many more grand adventures! 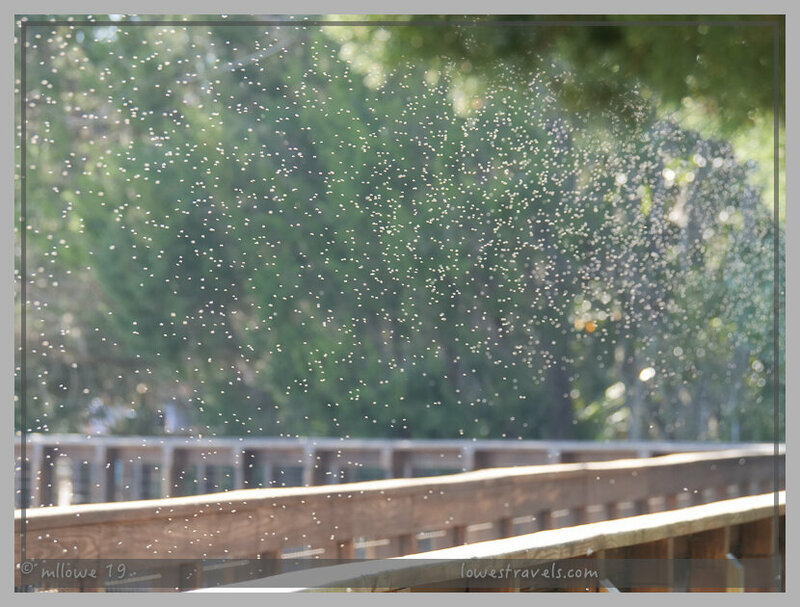 Because of the crazy mix of weather, bugs and humidity were not much of the bother. It was the unseasonal cold and constant overcast days that dampen most of our days but we made do of what we got.At least Steve enjoyed what he was wishing for. We are really looking forward to Florida next year after this lousy desert winter, but that picture of the noseeums reminded me that there’s a bad side to winters on the east coast too…. I do NOT miss those bugs! 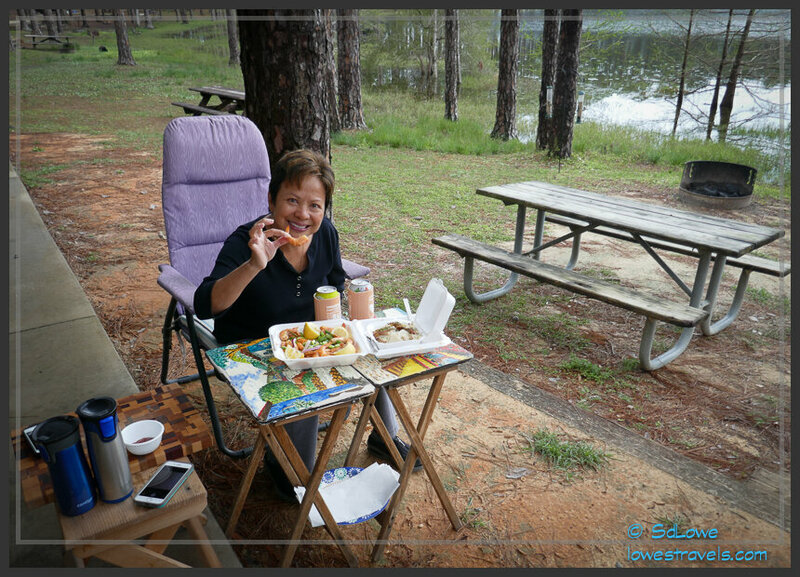 Still, as you’ve so perfectly demonstrated, there’s so much to see and do in Florida, it’s impossible to get bored, and, if all else fails, you can always gorge yourself on seafood! Awesome photos of the birds, by the way! Well, I guess we had the better winter this time 🙂 but no we won’t be back. Some bugs got me but they were lying low mostly due to the cold and winds and humidity was lower than the first time we were here. I wish you have a better winter in FL this winter ! We’re sad we weren’t there this winter-our first miss in 5 years. Otherwise we’d have made sure we met up! We were Florida residents from 2004 until last month (now South Carolina) But I never knew ALL those coast nicknames! Only a few. I always learn something from you two!!! I agree, even there were more overcast days than sunny ones, still it managed to take a peek once in a while. 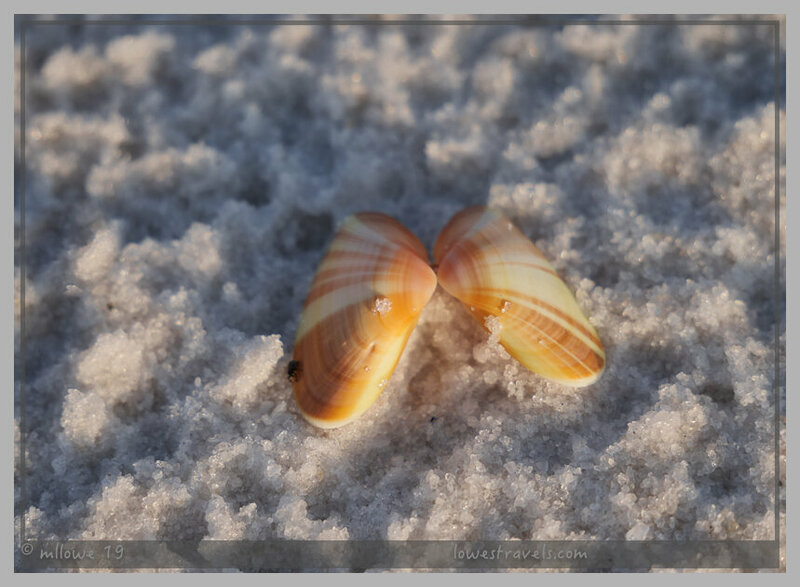 Thanks for sharing your Florida winter adventure. 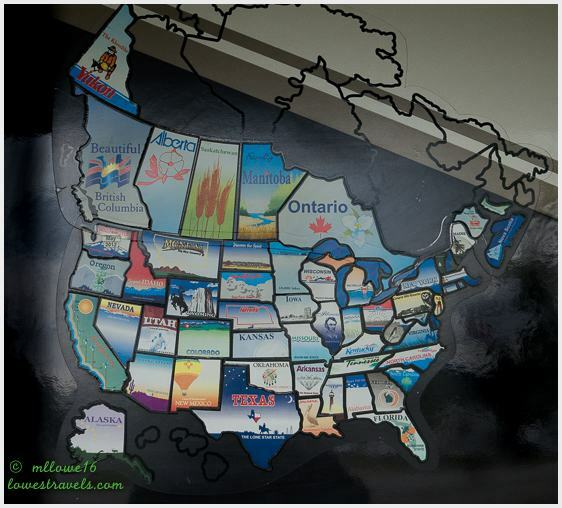 I really enjoyed reading all about your hikes, wildlife, beaches and camping spots. 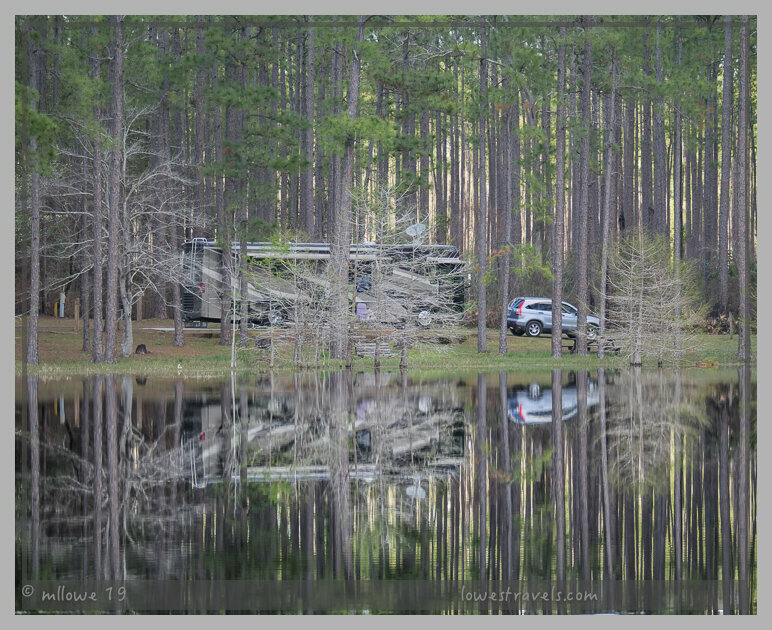 You seem to find the best rv spot the majority of the time. Most have great views. Safe & happy travels. Im glad you enjoyed tagging along. Thank you. Now that is how to stock a freezer. Ha ha ha and we are trying all kinds of seafood recipes! Sounds like you fit a lot of sights and activities into your FL excursion. Safe travels west and hope we can connect in AZ. Yes we did for neither one of us enjoyed staying indoors most of the time. What a great winter…even with the rain and cold…enjoying the sights, sounds and especially tasty seafood! Beautiful pictures as always MonaLiza! Looks like you had a great time in Florida, despite the dismal weather at every turn. It’s been an unpleasant winter most everywhere it seems. I miss those beautiful beaches so thanks for taking me there if only for a few minutes. Safe travels on your next adventure. It was so great to meet in person & fun sharing traveling stories! 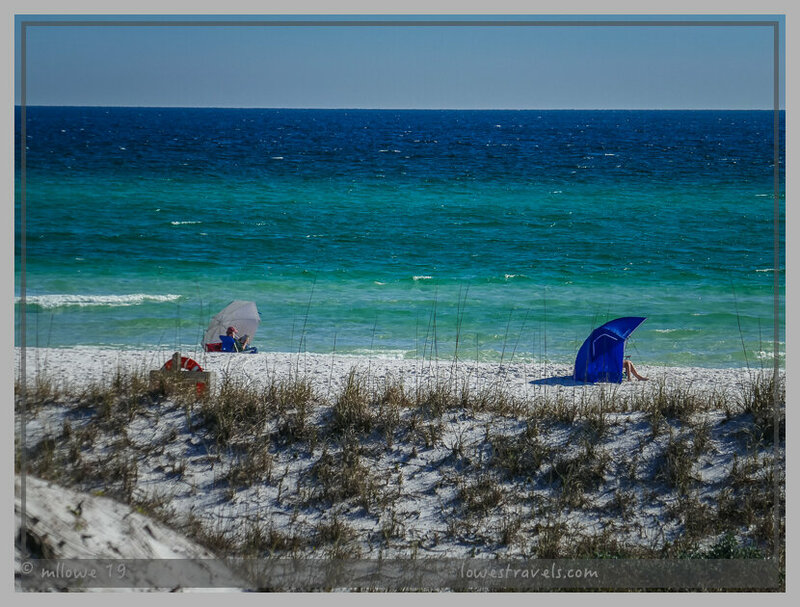 I’m jealous of all the bird pictures, we didn’t get to see much wildlife on the Emerald Coast. Awesome pics. Hope to meet up again & go on a hike….you can teach me some birding!! It was just too bad the cold snap messed up our outdoor activities. 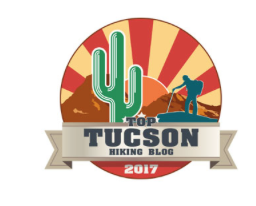 Who knows when we see you in AZ we can have more time to hike and go bird watching. What a great way to spend the winter! You saw the best of Florida. Thanks for sharing this recap with us. I love that you packed your freezer with seafood before heading west! Glad you like our Florida get aways. That freezer may be empty by the time we get to Tucson! Great recap! There is so much to do in Florida. You took some incredible pictures, I laughed at the one with the birds surrounding the guy with the throw net and shuttered at the one with the no-see-ums! 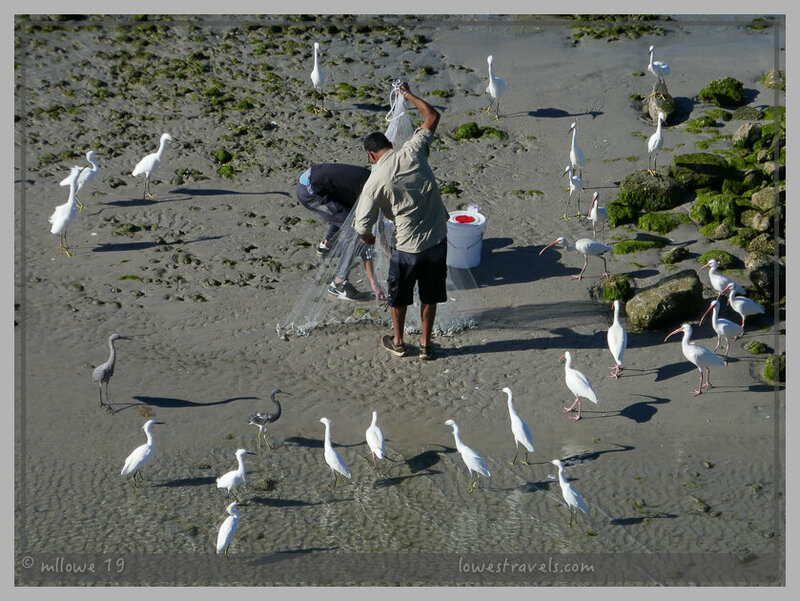 I know you would like the fishermen picture for you may have experienced that of birds waiting to steal or a handout.